The accession of India and Pakistan to the Shanghai Cooperation Organisation may represent a major change in the global equilibrium of the former (mainly) bi-polar organization of the world led by the United States and the United Soviet Socialist Republic (USSR). To understand the importance of this possible evolution, it is useful to place it in a long term history rather than a short-term political or economic point of view. The European world disappeared in the bloody World Wars of 1914-18 when about 10 million soldiers (adult men of working age) and about 9 million civilians were killed, and about 21 million soldiers were wounded. A complete generation disappeared. The cost of the war was so enormous that the traditional financial centres of the world such as London, Paris, Berlin, and the central banks also disappeared. The states were so indebted that what followed was a major financial crisis which destroyed all the currencies backed by the gold standard. The allied victory saw the USA become the central player in the leadership of the world. The USA was comparatively less affected by the destruction of war, suffered fewer human losses than other nations, especially Europe. The USA significantly benefited from the European indebtedness. The Soviet Revolution in 1917 hindered relations between the USSR and other states and during the 20th century the USSR sought a path of development, without any kind of relation with the “capitalist world” except war. This bipolarization was increased by the onset of WWII (1939 – 1945) which, in fact created a temporary alliance between the USA and the USSR, both fighting against the Nazis: agreements were settled during summits (Tehran conference, Dec 1943; Yalta conference, Feb. 1945; and Potsdam, July 1945 all with Roosevelt, Stalin and Churchill) The German defeat and the Iron Curtain worked to isolate the main Central European countries from political and economic spheres globally. The division of the world into two blocs: one led by the United States and the other led by the USSR froze the ability of nations to cooperate because they were mainly in one or another camp. The major change after 1945 was the decolonization which created a number of independent states who sought to find their place in the broader international system. This phenomenon which could have been an opportunity to give birth to another group of states failed, as one by one, the former colonies joined either the USA or the Russian camp and relied on that bloc for most of their security and economic needs. Some of them became involved in civil wars between partisans of each of the two blocs. The 20th century was mainly characterized by a bi-polar world. Up until the 70’s the two blocs were able to compete in terms of population, demography, armies, etc. the influence of USSR and Marxism was important amongst the intellectuals. USSR was a kind of counter-model attracting scholars, artists, etc., who contributed to the idealization of the eastern regime. This was also reinforced by pacifism and the opposition to the war in Vietnam (1955-75) as well as the anti-colonialist movements. The 70’s were the turning point of the situation. It began by a major crisis brought about by the decision on August 15, 1971 to end the Bretton Woods Accord: the USA abandoned the Gold exchange standard for a floating system. Soon after, the countries producing petrol, decided to increase the price of the petrol, and to limit the quantities produced (1971, October 1973). The 70’s saw an increase in tensions and rivalry between the two blocs which were affected by the economic crisis brought about through the collapse of the Bretton Woods Accord. In the capitalist countries, unemployment increased sharply and the real income of the population decreased. In the socialist countries unemployment did not exist officially, but the real income of the families also decreased, and the intervention capacities of the state also decreased (the State was in control of the whole economy). Little by little the “soviet heaven” lost its attractiveness in western countries. Many intellectuals already condemned the intervention of the USSR tanks on August 21, 1968 in Czechoslovakia. Soon after the publication of a controversial book by Aleksandr Solzhenitsyn entitled The Gulag Archipelago in 1973, which explored the reality of the deportation of millions of persons forced to work in concentration camps or the displacement of nations (i.e. Chechens, Armenians, Georgians, who were then sent to Siberia or Kazakh and Uzbek Republics) the eyes of the last journalists, and academics supporting the Soviet model were opened, and they began to doubt the overall effectiveness of the Soviet system. It marked the end of the influence of the USSR abroad. The invasion and the war in Afghanistan in 1979 was the real beginning of the end for the USSR. Russia was not able to support the cost of the war; its opponents were supported by the USA (increasing aid from $40 million in 1983 and up to $630 million in 1987), which they provided to help struggling and under-developed economies such as Saudi Arabia. The economic and security situation in Russia and in all the Eastern European countries that were formerly under the control of USSR deteriorated throughout the war (1979-1989). For example, in Poland, the Polish trade union Solidarity (Solidarność) created in 1980 organized its first strike against increases to food prices. Trapped in an economic crisis; a war in Afghanistan; and constrained within an ineffective bureaucratic system which was made worse by the inability to hold national elections, the USSR was condemned to a long period of political instability. On June 8, 1982, United States President Ronald Reagan said, “the forward march of freedom and democracy will leave Marxism–Leninism on the ash heap of history”. His support for the Afghan opponents to the USSR, the development of the economic crisis and the Strategic Defense Initiative (SDI) first proposed in 1983 accelerated the end of the soviet regime. In November 1989, the Iron Curtain was destroyed in Berlin, the reunification of Germany cut into two parts since 1945 was the most significant event in this period of history. 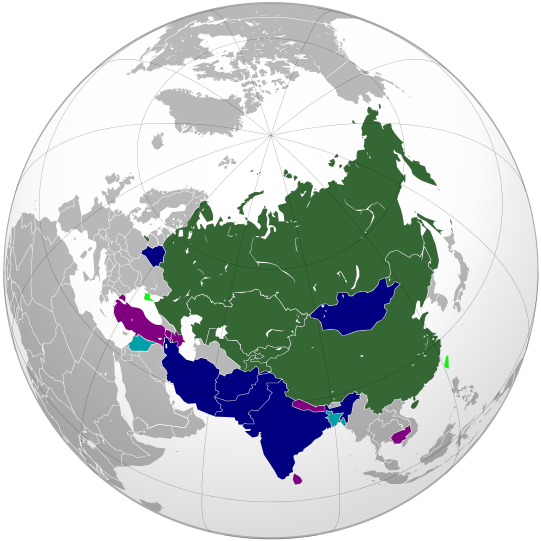 In 1990-1991 USSR collapsed completely giving birth to 15 new republics. All the Eastern European Countries became independent and free elections were organized. The transition to democratic Parliamentary systems was largely supported by Western countries led by the United States. Some of them joined the European Community and some of them are already a part of the Euroland. Between 1990 and 1991, the USSR collapsed but there was nothing in place to set up a new regime. The country embarked upon a “highway to hell”. In August 1991 a putsch was organized against President Gorbachev of the USSR; without the support of the general population and of the army, it failed. On December 8th 1991 ten Republics proclaimed the end of the USSR and on December 25, the red flag fluttering at the top of the Kremlin came down. The country that defeated Hitler, that sent the first man in the space and that was the heaven of earth for millions of Communists around the world did not exist anymore. On the international stage, a new organization was created in December 1991, the Commonwealth of Independent States (CIS) aimed to try and bring about a network with the former countries of the former USSR. The economic crisis was very violent. At the end of the Communist regime, only 2% of Russians were living under the poverty line ($2 per day), but by 1989 the total percentage of Russians living below the poverty line had increased to 24%. Unemployment increased from 0.1 % to 8 %, the Gross national product decreased by 8 % during the same period. Russia from Europe to Asia? The collapse of the USSR left the USA as the main ruler in the world. The US strategy tried to limit the influence of Russia as much as possible. The first Gulf war (1990-1991) created the conditions necessary for a permanent American presence in the region. The attack on September 11, 2001 was a direct consequence of the first Gulf war. It gave the United States an opportunity to attack Afghanistan, then to attack Iraq and to develop a number of military bases in the Middle East and also around Russia. What is the present situation? Russia has few opportunities to develop their relations with the Middle East. The pro-Russian countries are not so numerous, two of the Russian allies in the Middle East include Armenia, the small “republic” of Abkhazia (a part of Georgia), whereas the Anti-Russian countries are far more numerous. The influence of the USA or Europe is important in the Middle East and there are few possibilities for Russia to increase its influence there. Europe will not leave Greece to develop close relations with Russia, even if the Greek Prime Minister Alexis Tsipras tried to get the support of Putin against the ECB and IMF. The influence towards the Balkan countries of Russia is hindered by the ongoing situation in Ukraine. The traditional relations with Bulgaria (one of the few countries using the Cyrillic alphabet and practicing the orthodox Christian faith) are blocked by the fact it is impossible for Russians to cross Ukraine and to come in Bulgaria. Serbia is actually more attracted by Europe than by Russia: The former Serbian president, Slobodan Milosevic, benefited from diplomatic support from Russia. Even after the massacres of Srebrenica (about 8,000 men) in July 1995, Russia tried to stop (March 19, 1999) the decision of the UN Security Council of bombing Serbia. After the collapse of the Nationalist government and the transfer of Milosevic to the International Criminal Tribunal for the former Yugoslavia (2001), the new government applied to become a state member of the European Union (2007). Balkan countries are already using the euro: even Montenegro uses euros instead of a national currency! Moldovia has poor relations with Russia because of questions over Transnistria, a part of Moldovia whose petrol is annexed by Russia. The other European countries are strongly against Russia, because of the historical tensions which still exist over the soviet regimes that the USSR imposed upon them. Let us list Poland that was occupied by Russia for many centuries; the countries along the Baltic sea (Lithuania, Latvia, Estonia) were also under Russian occupation from 1945 and they joined Europe and euroland after the collapse of USSR. And at the northern border, Finland engaged in a war against Stalin and also joined Europe and euroland following the collapse of the USSR. The attitude of Russia, the shooting of the Malaysian plane in 2014 and the war in Ukraine have combined to push Europe into adopting sanctions against Russia. Russia has been somewhat isolated from Europe, they are losing Ukraine, which remains an important source of petrol. Russia has lost considerable influence throughout Europe since the fall of the USSR in 1991. The situation has only worsened during the last few months. The war in Ukraine is expensive. The sanctions continue to harm the Russian economy, inflation is increasing and there is no hope of economic improvement any time soon. The speculation against the rubble caused a dramatic decline in value on the global currency markets: the Russian currency fell from 60 rubble for every US Dollar to more than 100 before rebounding to about 65-70. Falling petrol prices also decreased the national income of Russia, further impeding its competitiveness on global markets. In December 1991 the creation of the Commonwealth of Independent States (CIS) was largely a response to the disaggregation of the USSR. This CIS was not very efficient, except in maintaining the political links between the new republics. The economic crisis that followed the creation of the CIS blocked all possibility of economic development. Soon after the end of the crisis in Russia, on June 14, 2001, a group of countries from the CIS signed a treaty creating the Shanghai cooperation organization (SCO). It was an important step for a former group of five states created in 1996 that was mainly limited to the questions of borders and the resolution of incidents between the countries. Up to now, the Shanghai cooperation organization has solved some problems arising from relations at the border between Russia and China. During recent years several incidents occurred along the 2,500-mile border arising from tensions between Russia and China. The tensions were linked to the situations of some ethnic minorities that tried to escape from China, such as the Uyghurs, a group of Turcs, Islamists, whose relations with Beijing are conflictual. A large number of them (more than 50,000) took refuge in USSR. The most important was the 1969 incident along the Ussuri River where China and Russia disagree on the possession of the small Damanskii Island, when about 60 Russian soldiers were killed in conflicts over the Island. All these tensions were solved by bilateral discussions. Now, it seems that the actions of the two countries are aimed bringing back peace and stability. The SCO also organized some naval and military manoeuvres between the two countries which are an important diplomatic step towards closer ties between the two countries. However Russia has a larger ground army which includes a good group of tanks and China has a larger naval army. Air forces seem to be similar for both countries. In any case, the SCO may play a very important role in creating more harmonious relations in Asia, especially as one way of decreasing the risks of war between Asian nations and Western ones or to solve minor military incidents between Asian nations. Is it a military union? No, or at least not entirely! It is important to understand the “with and without” of the SCO. Aside from the Member States (China, Russia, Kazakhstan, Kirghizstan, Tajikistan, Uzbekistan) there is a group of Observer States (i.e. Afghanistan, Belarus, Iran, etc.) and a group of Dialogue Partners (Armenia, Azerbaijan, Nepal, etc.). On the contrary membership was refused to the USA and to Japan. The clear aim of the SCO is to counter US dominance in Asia. It is also clearly connected to the debates surrounding the Kuril Islands which the Japanese claimed as their own territory in at the end of WWII and the Senkaku Islands disputed between China and Japan, in which the United States has publicly supported the Japanese claim to the Islands. As we can see the OCS is effectively creating a group of states not linked to, but rather in opposition with the USA. This opposition includes Japan, considered as an ally of the US, with the American bases in Japan, especially in Okinawa (there is a plan to enlarge and reorganise these bases), and the controversy concerning the visits of members of the government to the Yasukuni Shrine where the names of the soldiers are listed including some war-criminals. What about the economy? This is the weak point in relations between the USA and Russia. The relations between Russia and China are still uneasy. Eastern Siberia remained underdeveloped until the end of WWII. However sustained efforts from Russia to create new centres in Far Eastern Russia are gaining momentum. In 2012 a summit of the Asia-Pacific Economic Cooperation bloc (APEC) was organized in Vladivostok. It was an opportunity for Putin to construct a huge special building (that is now the new university) and to inaugurate a new airport. It was a demonstration of wealth in front of the representatives of the 21 states participating in this meeting which aimed to work towards a free trade agreement for Pacific nations. However, up to now Russia can mainly propose natural products such as gas as a key driver of international trade. China can have a very important and large market to sell Chinese manufactured products. The question of transportation may also be largely resolved after the signing of a new treaty to install a high speed rail network between Moscow and Beijing. It would be a very good opportunity for China which has constructed some of the most renowned high speed train networks (such as the Canton – Beijing network). In 2014 the Eurasian Economic Union (EEU) was created as a means of bringing about an economic union between Belarus, Kazakhstan, Russia, Armenia and Kyrgyzstan. It creates an integrated single market with nearly 190 million people and the purpose is to create a new unique currency underscored by a Eurasian Development Bank. This EEU would act as a counterweight to the European Union in Eurasia. In July 2015 India and Pakistan were accepted as members of the Shanghai cooperation organization. The USA tried to prevent this membership. With these new members SCO represents now nearly one half of the world population (40 %). Its weight inside international institutions will prove increasingly important: the group holds three seats out of the five in the BRICS bloc, four in the G20, and two out of five seats in the UN Security Council. The enlarged SCO is clearly a new pole in a multipolar world. Is it the end of the bipolar system? Yes and no. We can consider that the actual world is ruled by the USA and Europe if we take into account both the population and the GNP. Aside from these two key indicators there are a lot of important countries, who still remain isolated. In the event that Russia, India, Brazil and China united to form a huge bloc, this could bring about the emergence of a new pole. The Shanghai cooperation organization joined well educated nations, with good universities. Up to now the development was a consequence of the technological structure, such as the possibilities for citizens to attend university, to have a safe environment with good law enforcement and a relatively high standard of living and quality of life. Also important is the ability to use enough energy to create the conditions for economic development. The development of nuclear plants has made energy production cheap and abundant. For China or India, nuclear plants make them free from coal mines and their adverse environmental impacts. Education is completely transformed by the internet, which has led to the creation of Massive Online Open Courses or MOOCs which make education freely available to a much larger audience for the first time. Expatriation is no longer the only way to be educated and to receive a University degree. There is a kind of complementarity between the members of the Shanghai cooperation organization. Russia has a demographic problem linked to a decline in the number of births which was closely linked to the economic situation in the 1990’s which was not the case for other member nations. Russia also has very large natural reserves (gas, petrol, wood) that are sometimes missing in other nations and so create a good market for international trade which could benefit Russia economically. With global warming, Chinese or Russian territories could be used for cultivation for the first time. The development of the Shanghai Cooperation Organization may be one of the major factors leading to the wholescale transformation of international relations in the 21st century. First it marks a complete shift in the external politics of Russia. It marks an end to the ambitions of Peter the Great, the famous tsar (1682-1725) to transform Russia into a European country. The SCO also changes the role of China in the region, as it seeks to play a leading role in the world. Georges Depeyrot is director of research at the Centre National de la Recherche Scientifique and at the École Normale Supérieure (Paris). His specialization is in economic history.